John surrounded himself with "yes men" who bent to his will; John tended towards despotic rule; John resented anyone who was smarter than him; John was arrogant; John tended towards giving mepuis; John was possessed of the common touch. 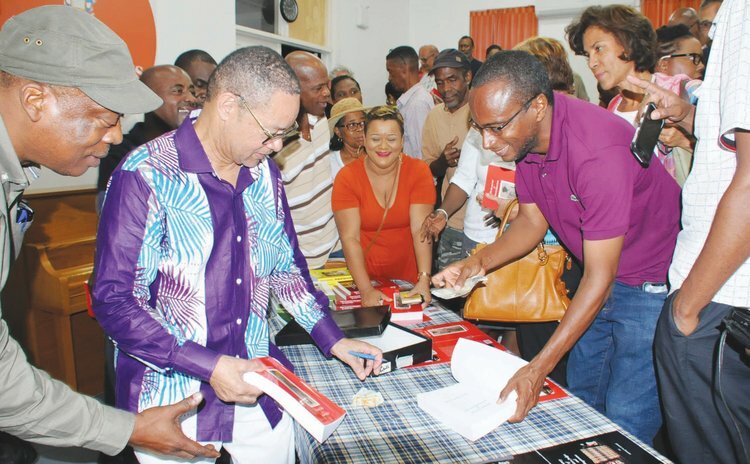 So writes Gabriel J. Christian in the preface to "The Rise and Fall of Patrick Roland John", Dominica's first prime minister, in the 487-page book by Dr. Irving W. André that as launched last Friday evening at the Open Campus of The University of the West Indies. "To his credit the record does not reveal Patrick John to have been someone given to the speedy amassing of wealth at the expense of the national treasury," says Christian of John, better known as "PJ", who ruled Dominica from 1974 to 1979 until he was deposed in a parliamentary coup following widespread and deadly demonstrations. For three hours on Friday, about 100 persons packed themselves in the small but cozy UWI auditorium to listen to Dr. André, a judge who lives and works in Canada, outline the history of the turbulent Seventies that ushered in Dominica as an independent state. "The book traces the rapid rise and spectacular fall of Dominica's first Prime Minister," writes André in the back of the red-covered book. "It analyses the factors that contributed to John's rise to power, the forces that opposed him throughout the 1970's and the causes for his dramatic fall from grace after May 29, 1979". But are there obvious lessons to be learnt from that painful era in Dominica's history and are there signs that history is about to repeat itself? "Indeed , the scandals in governance where they have afflicted administrations…should teach us all that constant study of our past is essential to finding true north in the future," answers Christian. "The message inherent to this splendid work is that one should never squander the goodwill of the masses and become deaf to the people's cry for justice. History teaches that arrogance by any leader is a rebuke to democratic ideals of public service and ultimately self-defeating. Political power is never everlasting, and every leader must strive to serve the national interest, not just one's party or cronies". "It is imperative that we understand history," said Dr. André. "It is imperative that we try not to whitewash it because Dominica is such a fragile democracy". As a prescription to the creation of a more equitable society, Dr. André said: "Everyone should have this equal opportunity to achieve his or her goals; no one should be excluded because quite frankly they were colour blind or they wear the wrong colour. No one should be excluded because they did not show sufficient loyalty to any deity." In addition to "The Rise and Fall of Patrick Roland John", on Friday at UWI, André also launched "A century of Dominican Judges and Magistrates" a 200-page book that traces "the island's proud intellectual tradition which has produced, since the early decades of the twentieth century, a number of distinguished legal practitioners and judges who blazed a trail of excellence in Dominica", the Caribbean and the world. "A century of Dominican Judges and Magistrates", however, does not mention the infamous Leo Austin, the Attorney General who was at the centre of most of Patrick John's notoriously crazy schemes.